DOOM comes in two different editions: The Day-One and the Collectors Edition. Those of you who are waiting for a long time on a new DOOM, and fans of the series, you may be interested in the Collectors Edition. See below to find out what bonuses include in both DOOM editions. The Day One Edition of DOOM appears with additional content, which may enjoy only the pre-order (and buyers of the Collector's Edition). It does not matter where you order this version, because providers like Steam, Amazon (incl. Steelbook) and others serve with the same downloadable bonuses when pre-ordered DOOM. The prices for the Day One Edition will be about $60 (PC) and $70 (consoles). In addition, you will receive the following content. 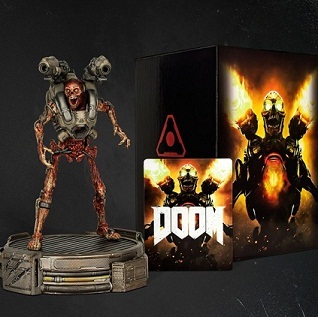 The Collector's Edition of Doom appears on the same day and is limited. This edition will const you about $ 140. In addition to the pre-order bonuses this version also includes the Steelbook and a figure (30 cm). This standing on one foot, which can rotate and is illuminated with LEDs. You can buy the collectors edition exclusively at selected retailers. These include Amazon, GameStop and of course the Bethesda store. Owners of Xbox One can also look forward to a special version that brings them in addition to the Season Pass, DOOM 1 and DOOM 2. This is DOOM Digital Deluxe Pre-Order. For this you need to Pre-order the new DOOM on the Xbox Store. You get the code for the two games within 7 to 10 days after ordering. The PS4 owners also can look forward to a Season Pass, if they buy the Digital Deluxe version.